In March 2013, while writing my undergraduate history thesis on Hubert Humphrey’s role in the 1944 DFL merger, I spoke with University of Minnesota professor emeritus Dr. Hy Berman. As Minnesota’s “unofficial state historian,” I was excited not only to meet him but also discuss his friendship with the former vice president. One topic we spent much time on was Humphrey’s teaching at the University. All uncited quotations come from the transcript of our interview. 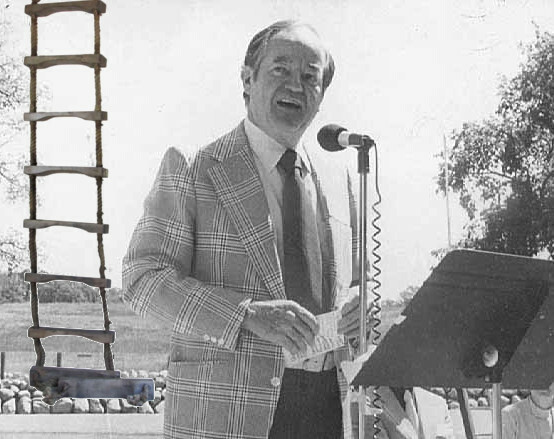 Vice President Humphrey and his rope ladder. (Original photograph from the Minnesota Historical Society). In 1969, after having lost the presidential election to Richard Nixon, Hubert Humphrey was, for the first time in twenty-four years, a private citizen. Having served as Minneapolis mayor (1945-1948), a U.S. Senator (1949-1965), and vice president (1965-1969), he returned home to Waverly, MN, disappointed but unready to retire. As the dust from the campaign settled, Humphrey was already on the phone with University of Minnesota President Malcolm Moos discussing his return to teaching. Receiving joint appointments at both the University and Macalester College, the former vice president eased into his new life with several public lectures ranging from national security to the legislative process. As an adjunct professor, in the fall of 1969 he taught his first course, the undergraduate-level “Government and Society,” which a press release described as a “colloquium [that] will cover the whole range of public policy and government and society.” Taught one night a week in Blegen Hall, it was an opportunity for Humphrey to share his decades of experience with the next generation of political leaders — and because of this, students were screened ahead of time, having to meet certain prerequisites. [H]e made sure that someone covered his classes and we had a string of people come in to my office. One day [Sen.] Barry Goldwater walks in, unannounced, “I’m here to take Hubert’s class cause he had to go somewhere.” A lot of characters came in whenever he couldn’t make a class, they flew in to take his class and flew right back out. This just went on and on and you could just see students’ faces falling. This wasn’t what they wanted (31-32). They were concerned the hostility of the students and faculty was so great that they thought he may be in danger. Fortunately, Humphrey never had to use his rope ladder. During these two years, the only students who harassed and humiliated him were from Macalester. In fact, the former vice president told a friend that “by the end of that year his stomach muscles were just tensing up whenever he got near the … campus” (Sorauf 31). In contrast, the worst he experienced at the University was a symbolic protest from faculty members. [S]ome of the most hostile faculty members invited him to a class hoping to catch him in errors and stuff like that. They invited him in with hostility, they came out with admiration. That’s how he won people over. Humphrey remained at the University for only two years, deciding in 1970 to replace retiring Sen. Eugene McCarthy. He remained in the U.S. Senate until his death in 1978. At that time, in his honor, the University renamed its public administration school the Humphrey Institute (later the Humphrey School of Public Affairs). Interestingly, this is where his successor and fellow vice president Walter Mondale teaches today. Berman, Hyman; Chambers, Clarke A.. (1984). Interview with Hyman Berman. University of Minnesota. Retrieved from the University of Minnesota Digital Conservancy, http://purl.umn.edu/48992. Berman, Hyman; Preston, Joshua P. (2013). Interview with Hyman Berman. Unpublished Transcript. Sorauf, Frank J.; Chambers, Clarke A.. (1984). Interview with Frank Sorauf. University of Minnesota. Retrieved from the University of Minnesota Digital Conservancy, http://purl.umn.edu/50623. University of Minnesota News Service. (1969). Press Releases, July – September 1969. Retrieved from the University of Minnesota Digital Conservancy, http://purl.umn.edu/51860.